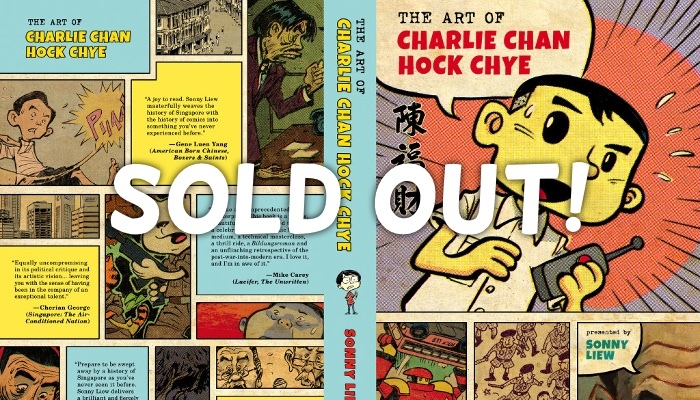 If you were thinking of grabbing a copy of The Art Of Charlie Chan Hock Chye by writer and artist Sonny Liew after it very swiftly sold out its first print run, we bear some bad news: the reprint of the graphic novel that got many talking is sold out yet again — all 1,500 copies. According to publisher Epigram Books, The Art of Charlie Chan Hock Chye is the top-selling local fiction title so far this year. Even in mega bookstore Kinokuniya, the graphic novel has topped the bestsellers list, ousting lingering mainstays like Haruki Murakami, and the poppycock that is 50 Shades of Grey. When it made news that the National Arts Council withdrew an $8,000 grant on the eve of the launch of the book because it contained ‘sensitive content’, it only served to lure the public to find out more about it. Unsurprisingly, the book sold out — and twice now. In an interview with The Straits Times, publisher Edmund Wee said that another 3,000 copies will be printed. 2,500 copies have been sold since the book’s release last month. Wee also said that most of the graphic novels published by Epigram Books take two years to sell 1,000 copies. Nice work, Charlie Chan Hock Chye. The very meta novel features a local artist who recounts the past 60 years of history through his comics where politicians like Lee Kuan Yew and Lim Chin Siong are part of the narrative. There’re even fictional characters like the Orang Minyak and Roachman, a nightsoil collector who acquired superpowers after being bitten by a cockroach. What makes it more frustrating for those who have yet to get a copy is that somewhere in the first and second reprint, reviews of the book are aplenty on the Internet, and damn, they all had to be super positive. With most naming the book Sonny Liew’s magnum opus, it’s not hard to see why. Amazingly crafted, with detailed art to accompany the complex and riveting storyline, it’s one piece of art Singapore can be proud of. We’re pretty sure we’ll finally get our hands on the next reprint — they say third time’s the charm.